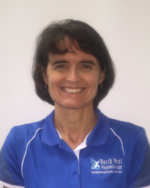 Maree is an experienced physiotherapist who has been with North West Physiotherapy for over five years. With a special interest in women’s health, Maree is building on her skills and training in this area and is working towards developing and expanding musculo-skeletal based therapy approaches. Maree has done postgraduate study in women’s health and brings stellar academic credentials with her to the practice. Maree has won both the Margaret Nicoll Memorial prize for Clinical Practice and the prestigious Aura Forster Prize, top honours for the highest theoretical proficiency during her Bachelor of Physiotherapy studies. Maree is a keen gardener in her spare time and enjoys walking for fitness.